Sweatpants & Books | Review of “The Book Lover's Guide To Coffee"
Okay. I’ll admit it. Coffee makes me a better person. Or at least a more tolerant person. Just last week, my entire morning was ruined when I accidentally knocked my Cinnamon Almond Milk Macchiato off the ledge as I was trying to carry it and a hundred other things inside the house. Hearing that cup fall and watching my elixir of the gods spill all over the ground made me want to weep. That mishap set the tone for my entire day! The only thing that surpasses my love for coffee is my love for indie bookstores. Coffee and indie bookstores go together like peas and carrots. While I could try to extol the virtues of coffee and literature myself, someone else has already done it quite brilliantly in “The Book Lover’s Guide to Coffee.” “to the flow of ideas and creative thought among like-minded folks. There really is nothing like caffeine to get your creative juices percolating! There are pithy quotes from coffee-obsessed authors; a page devoted to coffee stats; and an essay describing the science behind your coffee buzz, which includes a better understanding of why just the smell of coffee relaxes your brain. I loved learning the history of k-cups and marveled over the military coming up with a caffeinated applesauce! One statistic, however, really left me befuddled. Supposedly, the average American consumes 12 books a year. Are you kidding me? One book a month?! I cannot survive on one cup of coffee each day, nor one book a month. For me, coffee and books should both be consumed with abandon. And if you can enjoy your coffee in an indie bookstore, even better. And for a satisfying taste of the connection between coffee and books, check out “The Book Lover’s Guide to Coffee.” You will not be disappointed. 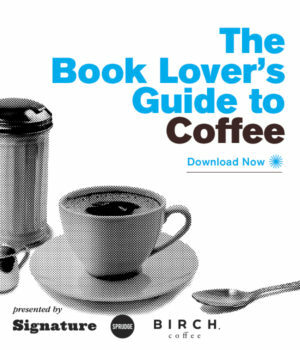 You can download your free copy of “The Book Lover’s Guide to Coffee” from Signature Reads here.